The work of Maria Thereza Alves involves aspects of current life or traces found in the present which point to actions taken in the past. Emphasizing the situation of indigenous peoples in America, the artist develops works that address issues of territory, cultural heritage and colonial history. Uma possível reversão de oportunidades perdidas [A Possible Reversal of Missed Opportunities] (2016) generates a discussion about aspects of autochthonous knowledge that are ignored by Brazilian institutions and their non-indigenous researchers due to a context still marked by a colonial imaginary. Alves, together with a group of indigenous university students, encourages the proposing of topics that are not addressed at the conferences of various research fields, such as health, engineering, education, science, art, culture and philosophy. From these topics, which take into account not only the knowledge of native peoples, but also their scientific demands, the artist produces posters for fictitious conferences whose dates provoke the idea that they have been held. 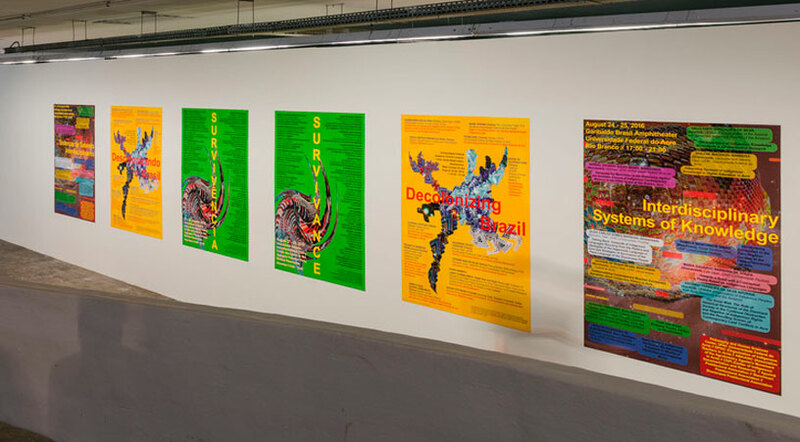 By means of these posters, her action aims at confronting the absence of this debate and the silencing of indigenous peoples in a systematic exclusion of their culture and knowledge in the Brazilian academic sphere and public life.